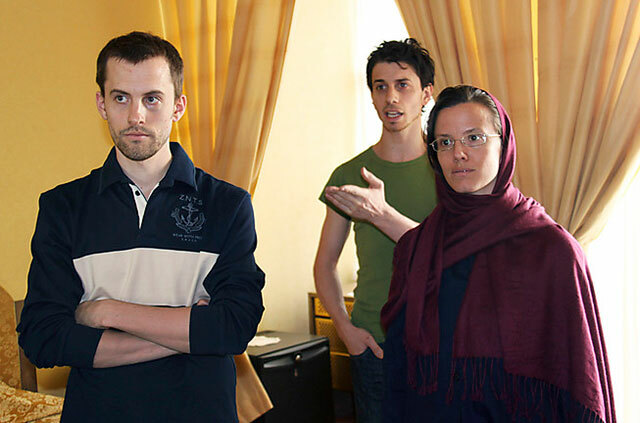 Shane Bauer and Josh Fattal, Americans jailed for two years in Iran on charges of spying and illegal entry into the country, were recently convicted and sentenced to eight years in prison by the Revolutionary Court of Iran. A third hiker, Sarah Shourd, spent 410 days in solitary confinement before being released last year due to health reasons. The three were hiking near the border of Iraq and Iran on July 31, 2009 when they were apprehended by Iranian authorities alleging that they had illegally crossed into Iran. Shourd, now 33 years old, was going through her Saturn return in Virgo when they were taken into custody. She was released on September 15, 2010, just two months after transiting Saturn left Virgo for the last time. Bauer and Fattal both recently turned 29 and are experiencing their Saturn returns right now in Libra. Some of Saturn’s possible significations can include confinement, isolation, and harsher conditions than usual. Most people will obviously not experience that to this extent even when under Saturn transits, but it is striking that this unexpected imprisonment did in fact happen during the hikers’ Saturn returns. That their Saturn returns are happening in Libra also seems like it’s adding in the theme of justice, one of Libra’s significations. To add a more common and positive Saturn return theme to otherwise uncommon circumstances, Bauer and Shourd also got engaged to be married while in prison, on January 6, 2010. This was just a couple months after transiting Saturn entered Libra for the first time, and thus began Bauer’s Saturn return. Saturn was also within a week of stationing, temporarily emphasizing that energy even more. People often make and/or break major commitments during their Saturn returns as they soberly evaluate their life structures and what is truly important to them. Saturn transited through Virgo one last time from April through July of 2010, so Bauer and Shourd’s engagement was essentially the overlap of both of their Saturn returns. Bauer and Fattal were born within a month of each other, on June 4th and July 13, 1982, so their respective exact Saturn returns are due to happen almost simultaneously, between September 5th and 8th, 2011. They were sentenced on August 21st and now have just 20 days to appeal, the end of which will be during this exact transit. This is obviously a pivotal time for all three of the hikers and their families, and I wish them a quick reprieve. If you’d like to view up-to-date news and ways to help, visit the website freethehikers.org. Saturn in Libra is exalted. Without knowing or having even seen the nativity chart, one would expect Saturn to ” behave” in the sign of its exaltation. I wonder if Libra is on the cusp of the 12th; signalling imprisonment/ suffering …and since the 12th is a cadent house Saturn’s “gifts” are kinda taken away. If this is the case we will find capricorn on the 3rd cusp and aquarius on the 4th … the ruler of the 3rd & 4th in the 12th: short journeys that end up in suffering…. I wrote and researched the above article, and I was able to narrow down specific birth dates for Bauer and Fattal, but not times. So, we don’t have full charts to look at regarding houses. By itself exaltation doesn’t guarantee a pleasant Saturn return; so much depends on interacting factors. For example, in these two charts Mars and Pluto are also placed with Saturn in Libra. Right away that puts both malefics being activated plus Pluto, which can be associated with intense experiences. A twelfth house Saturn return could be one possibility for issues of imprisonment, but we really don’t know if that’s the case here. If we had birth times, we would look at the house placements and houses ruled by Saturn, and also placements of Venus, the ruler of those Saturns, as well as what other simultaneous activations were happening with the charts during their Saturn returns. That’s why I only write generally on these news stories that don’t have birth times available, because so much depends on the full chart. Thanks for reading!